By the end of Dead Man’s Chest, there were at least six principle characters, each with different agendas and motivations, all butting heads with each other. What Dead Man’s Chest had done was to create a complex multi-faceted story which was complicated in places and would take an extended run-time to truly do justice. That At Worlds End never actually gets that boring is testament to how well it is put together. Not that this film is perfect. There is a simplicity that is missing here and plenty of storylines, scenes and characters that could be effectively removed to no real detriment to the movie. Geoffrey Rush returns to reprise his role as Pirate Barbossa and as great a character that he is, doesn’t add enough to justify the addition. Same can be said for famed pirate Captain Sao Feng. Played by Chow Yung-Fat, the character serves no proper purpose and feels like a cool filler to an already bloated cast. The movie is best when it sticks with what definitely works. 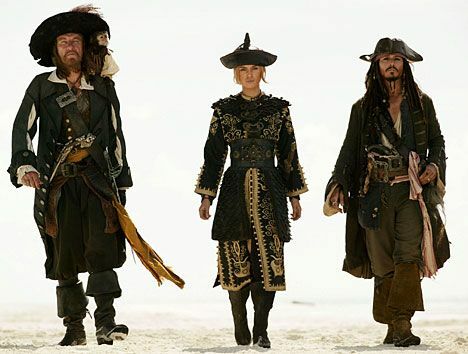 Knightley and Bloom are back on form here although get lost in the multiple-plot shuffle so it is back to Johnny Depp’s Jack Sparrow to hold up the movie and add the appeal it needs. As always, Sparrow is the funniest, most charming and most entertaining aspect of the whole film and the movie works so well because of him. One scene involving him locked in Davy Jones’ Locker and losing his mind, showcases some of Depp’s talent and how Sparrow can hold the screen just with himself. Which is a positive considering they have side-lined the best aspect of Dead Man’s Chest. Bill Nighy’s Davy Jones was a compelling, interesting and threatening villain but here he has been neutered and replaced in favour of Tom Hollander’s Beckett. Hollander plays a great villain himself but lacks the creativity that made Jones so interesting. So rather than rely on the characters, At World’s End must rely on the action and it has this in abundance. From a ship battle over a sea-whirlpool, a sword-fight atop a mast or swinging through the air on ship ropes, there is plenty of the inventive action which made the franchise so famous. Pair this with the rip-roaring soundtrack which punctuates each extravagant set-piece and you can’t help but be caught-up in the fantastical world. As for the stories, sub-plots and different threads? At World’s End does a fairly good job of tying them up successfully. It brings the trilogy to a close well and gives each of the key characters a fair send-off. Overall, At World’s End is a fitting end to the Pirates of the Caribbean trilogy. It has action, great set-pieces and plenty of Depp’s Jack Sparrow. Other characters get short-changed slightly, particularly Nighy’s Davy Jones but there is enough entertainment to tie the story up successfully.